Several of John's signatures from affidavits in Revolutionary War pension files. He was an "Ellinwood" when born, but used "Ellingwood" into the early 19th century when that spelling was favored in Beverly. On June 7th, the two American ships in company [Pilgrim and Essex] the Essex spoke to the [British] transport Good Intent, bound to Europe from Jamaica. Ten days earler she had been boarded by another Massachusetts ship, the Rambler, which had "stripped her of every thing except sick soldiers & women, we let her go again. Just as we spake the Transport, we saw a sail to leward & gave chace, in three hours spake her. The ship Defence, Capt. John Edmunds, belonging to Beverly, from Bilboa on a cruize." The three American ships kept company and early in the morning of June 10th gave chase to a ship that Robinson recognized as a Beverly privateer. Two o'clock that afternoon "not having spake [to] our chace, we saw a large ship to Windward runing for the midst of us...she first chaced us but gained not a yard, she then altered course for the Essex, the 2 leagues a stern of us we tacked ship and endeavored to get to the Essex, without success." The slower Essex was captured by a British Frigate [Queen Charlotte], the Defence disappeared and the Pilgrim continued its chase. Turned out to be the Rambler, Capt. Benjamin Lovett, recently out of Balboa. Another account from [Josiah Bartlett] as to the Good Intent "which we found to be from Barbadoes for Cork, with invalids, very leaky, and all hands at the pumps; had been taken by the privateer Rambler, from Salem, who gave them a passport to go on." Pilgrim and Rambler continued in company. On June 18th Pilgrim "took the Good Intent, not stated if same ship as before sent with prizemaster to Brest, Mr. Bunker, they then chased a Danish ship which they took, Capt. Robinson of Pilgrim. On the 22nd they sighted 7 ships bound from Gibralter to London. They took a ship with 8 guns and sent it to Brest (a favored port for privateers to take their prizes and remove their crews). The Americans dispersed, "the Rambler made sail to windward in quest for three of them [of the 7 ships mentioned], two of which struck to her in our sight, 1 ship 1 snow - both armed." One was captured and Pilgrim and Rambler continued together to other adventures not mentioned. "John Ellingwood upon oath declares that on the first day of January, A.D. 1776 he enlisted as a private soldier in Captain John Low's Company of foot belonging to Colonel Israel Hutchinson's Regiment the same being the 17th Regiment of the Massachusetts line, that he served in said company during the whole of the year 1776, that he was taken prisoner at Fort Washington in New York about the 17th November 1776 with about 2500 others being under the command of Colonel Magaw...that he was then marched prisoner into New York city and confined in a gaol then called New Bridewell - that on the first day of January 1777 when I was sent home on parol with a number of others." New Bridewell Prison. This and other images of the building were made well into the 19th century, but the very simple Neoclassical style of the building leaves the possibility that it looked like this during the Revolution. On the other hand, why would a building that is otherwise as finished as this be left without windows? The building may have been more utilitarian at the time and remodelled. Col. Hutchinson's regiment was at the Battle of Long Island in late August 1776. When the British were at a clear advantage and on the verge of overtaking the American army at Brooklyn Heights, Gen. George Washington used his assets. He had several brigades with sailors from Massachusetts North Shore towns, Beverly among them, commanded by John's uncle-to-be Gen. John Glover. In the dark of night they used their expertise on the water to get the army safely across the East River to Manhattan. It seems very likely that Hutchinson's men were among them. 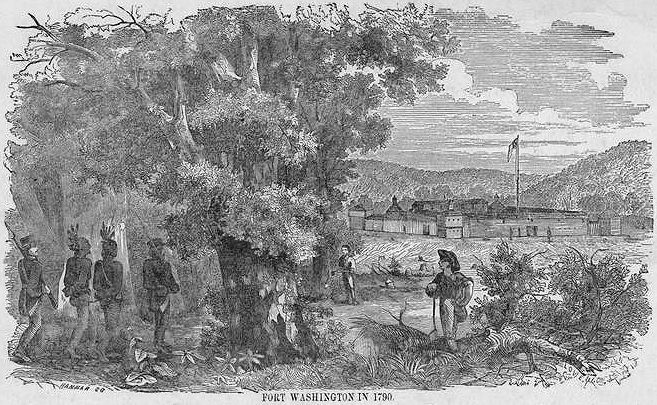 Part of Hutchinson's regiment were caught at Fort Washington at the top of Manhattan Island. They reportedly were ordered to take off their clothes and many died of exposure. At the prison, prisoner Oliver Woodruff says: "On Thursday morning they brought us a little provision, which was the first morsel we got to eat or drink after eating our breakfast on Saturday morning." "The prisoners were roughly used at Harlem on their way from Fort Washington to New York, where 800 men were stored in the New Bridewell, which was a cold, open house, the windows not glazed. They had not one mouthful from early Saturday morning until Monday. Rations per man for three days were half a pound of biscuit, half a pound of pork, half a gill of rice, half a pint of peas, and half an ounce of butter, the whole not enough for one good meal, and they were defrauded in this petty allowance. They had no straw to lie on, no fuel but one cart load per week for 800 men. At nine o'clock the Hessian guards would come and put out the fire, and lay on the poor prisoners with heavy clubs, for sitting around the fire." "The water was very bad, as well as the bread. Prisoners died like rotten sheep, with cold, hunger, and dirt; and those who had good apparel, such as buckskin breeches, or good coats, were necessitated to sell them to purchase bread to keep them alive." When the Federal act providing pensions to eligible Revolution soldiers, John made an application. He first received a pension on 6 April 1818 at $8.00 a month. In June of 1820 he was required to make an account of his real estate and personal property. Your declarant...states on oath that he was by occupation a mariner, but is now in consequence of his infirmities & has been for a long time unable to pursue his occupation, that he has a wife of a slender constitution, unable to do much work, aged about sixty, his sister Lois Ellingwood a singlewoman aged sixty three years resides in his family being alone in the world and no other friends to take care of her, being greatly afflicted with the disorder called the shaking palsy; your declarant further states that he is himself sixty seven years of age and severely afflicted with the rheumatism. John's son Ezra testified that "he [his father] is subject to severe attacks of the rheumatism and is unable to earn his living." Ezra also said that "On the third day of February A. D. 1807 I commenced supplying my father...with necessaries for his family such as beef, pork, molasses, coffee, flour, sugar, fish, etc. and have continued furnishing him with said supplies up to this present time." Ezra had also loaned his father money on which to live and by October of 1821, John's financial debt to Ezra was about $834.00. John then sold Ezra the house they were all living in (Ezra was a single man at the time) in consideration of $900.00, which Ezra says was a generosity for his father's sake given that the property was worth about six or seven hundred dollars." From this it can be guessed that John's rheumatism got bad enough to warrant him retiring from the sea when he was about 50, although an 1809 deed calls him Capt. 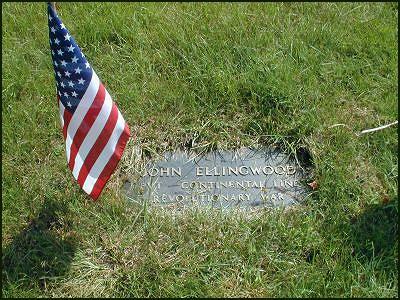 John Ellingwood, trader. The local court with jurisdiction over local pensioners declared that his estate had no value and John was granted a pension, but he seems not to have been given any money at the time, as will be shown later, and the pension was suspended. On 15 December 1823 John made an "application for restoration." Ezra and Lois made statements regarding John's finances soon after. Ezra said there was an "alteration, etc., in his property. The house & lot & barn...has been sold to Ezra Ellingwood on the 26 day of Oct. 1821 for $900, that being near what applicant owed grantee for necessaries for support of the family, & for debts assumed. Income of his wife's estate ($25) he has conveyed to "Miss Lois Ellingwood" to secure her in a debt due her of $75 - $11 of debts due applicant collected & the money used in the family - pig valued at $6, killed & consumed in the family. A new account of John's property was made in December 1823 that differs only slightly from the one made in 1820 (the candlesticks are missing) excepting the change in real estate. The court agreed with the account of the estate and valued it at $33.50. It also gives further details. Lois Ellingwood was given the income of Esther (Woodbury) Ellingwood's real estate for five years to cover John's debt to her. Aside from the pig, the cow had been sold "and the proceeds eaten up." Surely to emphasize the legitimacy of John's plight, Ezra calls him "a worthy & respectable ship master" (underlined as it is in the document). Lois' testimony says that about 1804 she sold John the house in which they were now living for $366.00 for which he gave her a note with interest. By June of 1819 the debt had been reduced to $176.00. John gave her his "life interest" in his wife's real estate in 1821. These circumstances apparently were not considered worthy since in March of 1829, John once again attempted to have his pension restored, this time stating that "he was dropped therefrom [the pension rolls] on account of his property." Yet another inventory of his estate was presented. Since the last account he had acquired "a wall pew in the meeting house of the Third Congregational Society in Beverly" (later called the Dane Street Congregational Church), a few more household goods such as candlesticks and tables, and some hay. Esther Ellingwood's real estate yielded less income, valued at $15.00. The entire estate was valued at $125.00. The pension was finally restored in May of 1829 and the amount of $43.38 was declared due to John since 1818. Tax records don't agree with the above account. John has real estate sporadically, but sometimes not at the time when he should or should not compared to his pension file. The period when Lois owned the house the tax records are missing. After 1825 the tax records clearly separate real and personal estate value, and from then on to 1831, John is listed as having real property, Ezra not (excepting his ownership or part interest in Safford's wharf). This is a major discrepancy. Tax records for the available years in the 1790s place John's name next to his mother's, and both paid real estate taxes. There were two houses that Ebenezer owned at his death, although an atlas from 18-- shows they were attached. One was bought by his mother-in-law (confirm and source this) and the other Elizabeth bought from the estate, being the one third remaining that wasn't part of her widow's right. Who owned which isn't yet known, but it's likely Elizabeth ended up with both. The 1798 Massachusetts Direct Tax is arranged alphabetically, so proximity can't be determined there. Her daughter Lois somehow ended up with at least one of these houses and sold it to John in 1804. She, John and John's family were living in it for decades afterward, and later censuses place John about where his father had lived at the foot of Cabot Street near the ferry. A photo from perhaps the turn of the 20th century shows a gambrel-roofed house at the corner of Water Street (later becoming an extention of Cabot Street) and Ellingwood Court. This was a mid 18th century building. Very close next to it is another but larger 18th century house. These undoubtedly were Ebenezer's houses, one probably used as the tavern and inn, but which, if not both, John lived in with his own family isn't yet known. After John died, the 1840 census places Ezra in the same area of Beverly. Confusing the issue is that Esther, his step-mother, was living elsewhere, possibly with but at least next to her stepson Ebenezer. That part of Beverly was where Ezra was living by 1850. That house had, according to oral history, been built for Benjamin Ellingwood in 1784. The house was on Cabot Street directly across from the First Parish Unitarian Church, of which the Ellingwoods were members. Ezra continued to live there with his own family after his father died. Ebenezer was probably the "E. Ellingwood" living on a street behind the Kittredge Mansion, which was across Federal Street from Ezra. To further confuse the issue, Ebenezer, Sr., owned an "old" house in this area around 1760, which was rented to Acadian refugees from Nova Scotia, but the Ellingwood house at Cabot and Federal Streets was not old enough to be that house. John, his two wives, sister Lois and son John, Jr., are buried side-by-side in the Hale Street Cemetery, now a part of Central Cemetery, Beverly. John's plot is not marked by a gravestone but the DAR has placed a plaque and flag on the site. John is the first generation in this line of the family to consciously adopt the spelling "Ellingwood," as seen in his signature, beginning roughly in the first decade of the 19th century. The few other remaining Ellingwoods in the Beverly area did the same. His second wife, Esther Woodbury, was his second cousin on both his father's and mother's sides. vital records sources: John's birth, death and marriage records and the births and early deaths and burials of his children appear in the published Beverly, MA, vital records. 1. He died without a will. His estate was probated 4 October 1836 but has not been seen. Essex Co., MA, probate file #8703. 3. Revolutionary War Pension File #S34809. 4. Beverly vital records. William's baptism is in First Parish Unitarian Church records.